I bought my truck with factory navigation and quickly found that it was not meant for RVs. On more than one occasion, it took me in places that we couldn’t really fit with the rig, and we were a little scared to get out of. I purchased a Garmin RV760LMT and it is by far the best GPS I’ve ever used, and one of the best purchases I’ve made for peace of mind. You can program it with your length, width, height, and weight, and it routes accordingly. It also allows for you to plan routes on your computer and upload them to the GPS, which is great for longer trips. 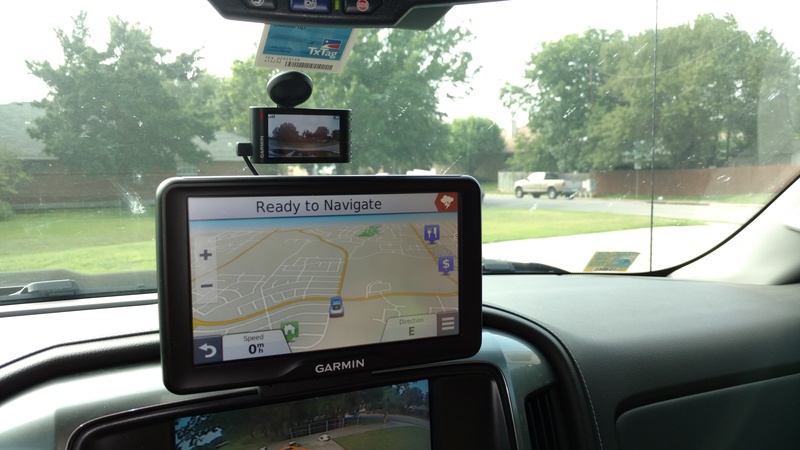 It also interfaces wirelessly with a backup camera that you can install on the back of the RV, which is great for lane changes and checking blind spots. All in all, a great purchase. I hardwired it into my truck using a EDO Tech Garmin hardwire kit, and that served wonderfully for the GPS. The wires are neatly tucked behind my dashboard and come out right behind my Proclip vehicle specific mount. I’m a fan for doing things like this right, and not having wires and makeshift mounts running all over the truck. In the time I’ve spent towing, I’ve been absolutely amazed by the amount of people who pull out in front of us — whether merging onto the road, or changing lanes — without any regard for the 8000+# truck and 10000+# trailer. We can’t stop on the dime, and one of these days I anticipate we won’t be able to avoid one of these people. As such, I wanted to add a dash cam to the truck. There are a lot of options out there, but most of them are brands I’ve never heard of, shipped in from China, with little information about them and questionable reviews. I already had the Garmin GPS so I decided to pick up their top dash cam, the Garmin Dash Cam 35. Since it uses the same power connector as the GPS, I picked up a Y splitter to avoid running new cables through the dash. When I installed the unit, I found that both the GPS and the dash cam were rebooting every two minutes or so, and I heard a new high pitched whine from inside my dash. I began pulling things apart, and found that the EDO transformer was extremely warm to the touch and producing that sound. I tried using the DC outlet plug that came with the device, and it was able to power both the GPS and dash cam without getting warm to the touch or them rebooting, so I figure the EDO transformer is unable to handle the current being pulled by both devices. I opened both the EDO box and the 12v plug, and noted that the components in the 12v were considerably larger, and opted to hardwire that plug into the vehicle by teeing off the input ground connection and fuse, and bringing them back to a part time power source. I put it back in the case, and using industrial Velcro to attach it to the inside of the dash. I completed the setup with a 64GB SD card. Update: the Edo tech unit has been overheating on us, so we hardwired a 5v 2a adapter into the vehicle instead. Also removed the ball mount for the GPS, because the GPS is too heavy and causing it to droop, and directly mounted the GPS to the bracket on the dash using double-sided automotive exterior adhesive tape.